So did everyone have a great April Fools day? Anyone pull off a prank or get taken by one? I really loved the Zoya Grassy Nails and almost believed it, especially with the increase of textured nails. Scrangie had my loling for a bit as well with her post, and I liked that she was able to poke fun at herself for taking such a long haitus from blogging. I have a swatch tonight of Hard Candy Crush On Tin from their Crushed Chrome Collection. I think that collection may be my favorite of all the Hard Candy collections that were released, but overall, the all the new polishes are truly amazing and innovative for a mainstream brand. Way to go HC for doing their research! Crush On Tin, a tobacco-y bronze fleck black polish, doesn't seem to be getting as much love as some of the other polishes, and so I wanted to show you how pretty it can be. 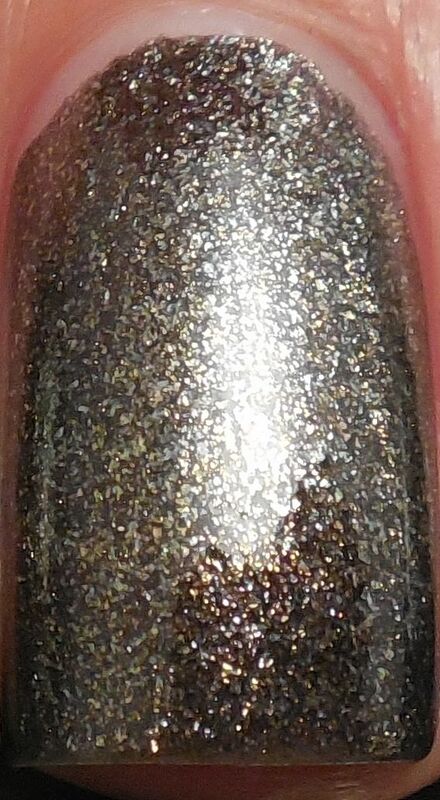 Initially I thought it would be another dupe for a Englands Beauty Never Fails or China Glaze Immortal, but instead it surprised me because it has not just the bronze flecks but silver flecks as well in the blackened base. In daylight, the colors play off each other and reflect green and orange. It's really a very complex polish. I used two super easy coats - the formula was really amazing for being only $3.99. No pooling or dragging, it was nice and buttery. I finished with a layer of Poshe to hasten drying. I really liked this shade and I think it's the sleeper of the entire collection. I hope more people start to give this shade some recognition and pick it up, it's just too pretty to miss. Which color is your favorite from the new Hard Candy releases? If you're interested in picking some up, they're now available on the Wal-Mart website.